Print out the letter C in a number of different ways with these fun printables - fun for display in the classroom or home! Cupcake and cake begin with the letter C, and so does cat, crayon ... all fun ideas to model with playdough! Help the kids learn how to make a little letter C with the help of this printable playdough mat. Fun! We are working our way through the alphabet with our plahydough mats - and here is the capital letter C to mold and decorate! A little boy holds the letter C above his head on this poster - just one of a complete set for the alphabet. We've got "alphabet of children" posters for every letter of the alphabet. Here is the letter C! Here's a fun activity to add to your "letter of the week" line up - a playdough mat which reinforces the letter C.
Alphabet posters make a great feature in any home or classroom, helping children become familiar with letters. This "C is for Cat" poster is part of a fun set we have created. There are colouring pages of all the images too. These handy worksheets are perfect if the kids are learning to write the letter C, and you can laminate the pages if you want to reuse them with wipeable markers. Choose from UK or US versions below. Do you know someone whose name begins with the letter C? Send them a letter with a personal touch by colouring in the beautifully illustrated letter C on this writing page. Is C your letter of the week? Then how about getting the kids to lace up these lovely letter C lacing cards? Use our funky letter templates to brighten up classroom and nursery displays. Print out the template then ask the kids to decorate the letters in any way they choose - there are endless possibilities! This template has a lower case letter 'c' ready to print and use. C is for crafts and creativity - and we think you'll find lots of fun and creative uses for this quirky letter template at home and in the classroom! 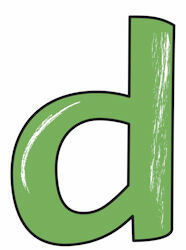 Here's the letter C in our outline alphabet printable set, ready for tracing.